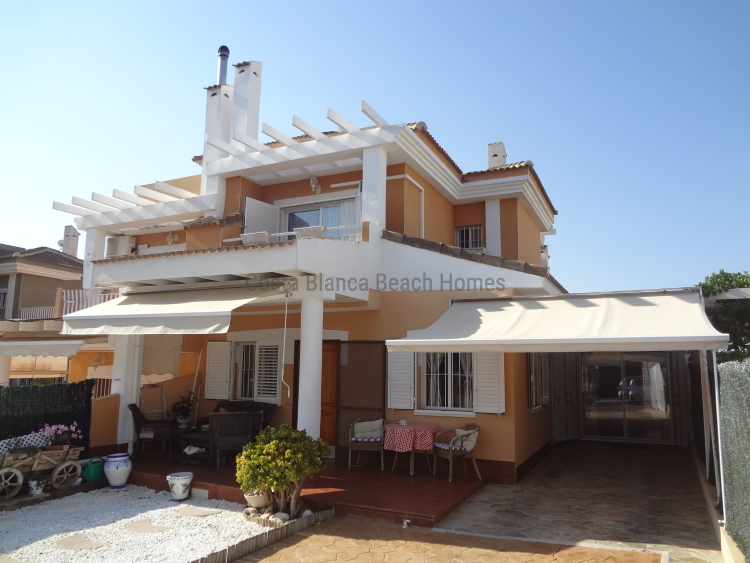 If you are looking for a spacious and bright property in a private complex with pool, paddle court and children's area, this semi-detached home with 183m2 plot is a nice place for living all year round or for your holidays. It consists of a large living roon with fireplace, separate kitchen (gas) with utility room, a bedroom and a bathroom, access to the terrace and the parking area equipped with many sunblinds for your comfort. On the first floor, there are 2 bedrooms, 1 bathroom and a terrace with some sea views and Alicante city. Situated in a quiet area near all amenities, at only 4 km from the beautiful sandy beach called El Carabassí, 10 minutes from the airport and 20 minutes from the center of Alicante city. Must be seen! It is a perfect house!